A New and Accurate Chart of the World. 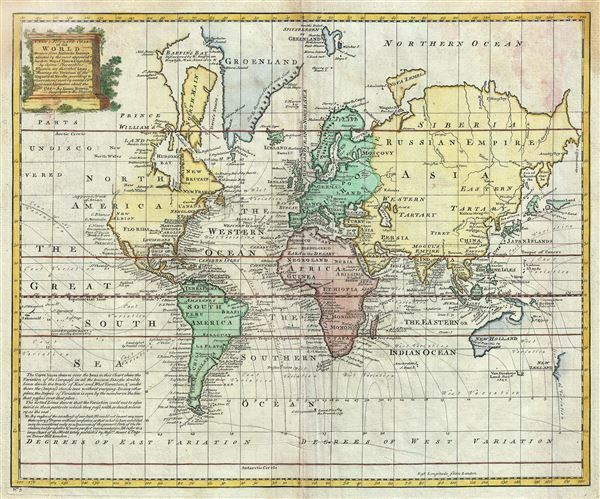 This is an extremely attractive 1744 map of the World by the English cartographer Emanuel Bowen. This beautiful map presents the entire world on Mercator's projection as it was understood in the middle part of the 18th century, before the landmark explorations of Cook, Vancouver, Wilkes and others. The map offers limited inland detail, but major cities, geographical landmarks, and regions are noted. In the tropics ocean currents are identified and continents are color coded. The map also shows the lines of magnetic declination and includes a note on the 'variation of the compass' in the lower left quadrant. Magnetic declination, or as it is more commonly known, magnetic variance, refers to the difference between true north and compass north. Magnetic variance changes both over time and from place to place, consequently accounting for compass errors. This was a major obstacle for many early cartographers. Bowen's chart notes this variation by curved and dotted lines at 3 degree intervals. This map is most interesting for its treatment of the western coast of America, the Pacific, and most importantly, Australia. Bowen issued this map during a dark period in Australian exploration, the seventy-some years between the navigations of William Dampier in 1699 and Tobias Furneaux in 1773. Consequently most of the cartographic information on this map dates to 17th century Dutch expeditions to Australia's western coast, such as those of Abel Tasman and William Janszoon. We see a very ephemeral speculative mapping of the continent with Van Diemen's Land (Tasmania) and New Guinea attached to the Australian continent. The unexplored eastern coast of the continent is speculatively mapped as a dotted line running from New Guinea directly south to the tip of Tasmania. New Zealand appears in a very embryonic form as a single landmass with no western shore. This most likely conforms to Abel Tasman's 1642 sighting of the western coast of South Island. Just to the north of New Zealand yet another mysterious landmass appears, this one is called 'Ter d' St. Esprit,' a speculative enlargement and mismapping of the New Hebrides Islands as discovered by the Spanish explorer and religious zealot Pedro Fernandez di Quir, or Quiros. Quiros, believing he had discovered the great southern continent of Terre Australis, mapped the islands much larger then they in fact were. Another smaller group of islands several hundred miles further east (appearing here in the lower left quadrant of the map) is also labeled after Quiros 'Land or Islands said to have been discovered by Quiros 1605.' Secretive, self-delusional, fanatical, and inept, Quiros made charts that bordered on fictional. It took several hundred years and no less a navigator than James Cook to finally figure out exactly what Quiros actually discovered. Though Siberia exhibits considerable detail consistent with Vitus Bering's 1728 exploration of the region, the opposite side of the Strait, in America, is less clear. Bowen identifies it as the 'Supposed Strait of Anian' and 'Parts Undiscovered,' leaving much of the northwestern parts of America blank. Anian is generally considered to be an undiscovered land or strait in the extreme northwestern part of America. The earliest known reference to Anian is in the narratives of Marco Polo, who describes it as 'East of India.' In many early maps Anian appears as an imaginary proto-Bearing Strait, the Strait of Anian, separating Asia from America. In many period maps and literature, Anian is associated with the Northwest Passage, John Donn wrote 'Anyan if I go west by the North-West passage'. He also labels 'Drakes' Port,' the site where Sir Francis Drank supposedly landed, claimed territory for England, restocked, and repaired his vessels during his 1579 circumnavigation of the globe. Today the true location of Drake's Port is a much debated cartographic mystery. What we know from Drake is that it is a safe harbor that lies to the north of the furthest Spanish Claim, Point Loma, along the coast that Drake named New Albion. Some have associated Drake's Harbor with San Francisco Bay, Bodega Bay, or San Pablo Bay, but since the relevant records were lost in the 1698 burning of London's Whitehall Palace, we may never know. Also of interest is Bowen's mapping of 'De Gama's Land' of Terre de Compagnie, just to the south of Siberia. Gama or Gamaland was supposedly discovered in the 17th century by a mysterious figure known as Jean de Gama. Various subsequent navigators claim to have seen this land, but it was left to Bering to finally debunk the myth. In 1729, he sailed for three days looking for Juan de Gama land but never found it. At times it was associated with Hokkaido, in Japan, and at other times with the mainland of North America. Bowen clearly does not give up on the idea. The truth of Gama is most likely little more than a misinterpretation of the Aleutian Archipelago as a single body of land. It continued to appear in numerous maps for about 50 years following Bering's voyages until the explorations of Cook confirmed the Bering findings. The mapping of Hokkaido (here identified as Yedso) joined to Sakhalin refers to cartography of Maerten de Vries and Cornelis Jansz Coen, who explored this land in 1643 in search of the gold and silver rich islands mentioned in a Spanish legend. Vries and Coen were the first Europeans to enter these waters, which were in fact little known even to the Japanese. They mapped the Strait of Vries, identified here. They believed this strait to separate Asia from America, which Compagnies Land formed part of, thus elucidating its magnificent proportions. They were also the first European navigators to discover Sakhalin and map its southern coastline. Apparently the Castricum was mired in a heavy fog as it attempted to explore these seas and thus Vries and Coen failed to notice the strait separating Yedo (Hokkaido) from Sakhalin, initiating a cartographic error that would persist well into the 18th century. Despite their many successes, the expedition ultimately failed to discover islands of silver and gold, thus proving definitively to Van Diemen that indeed, no such lands ever existed. The sea between Japan and Korea, whose name, either the 'Sea of Korea,' 'East Sea,' or the 'Sea of Japan,' is here identified in favor of Korea (Sea of Corea). Historically, Korea has used the term 'East Sea' since 59 B.C., and many books published before the Japanese annexed Korea make references to the 'East Sea' or 'Sea of Korea.' Over time, neighboring and western countries have identified Korea's East Sea using various different terms. The St. Petersburg Academy of Sciences referred to the East Sea as 'Koreiskoe Mope' or 'Sea of Korea' in their 1745 map of Asia. Other seventeenth and 18th century Russian maps alternate between 'Sea of Korea' and 'Eastern Ocean.' The 18th century Russian and French explorers Adam Johan von Krusenstern and La Perouse called it the 'Sea of Japan,' a term that became popular worldwide. Nonetheless, the last official map published by the Russians name the East Sea the 'Sea of Korea.' The name is currently still a matter of historical and political dispute between the countries. Throughout, Bowen identifies various other discoveries by Baffin, Dampier, Davis and others. A beautiful title cartouche is included in the upper left quadrant. This map was prepared by Emanuel Bowen as plate no. 3 for the 1747 issue of A Complete System of Geography. Very good. Original platemark visible. Minor wear on original centerfold. Backed with archival tissue. Rumsey 3733.003. Philips (atlases) 614 (1752 edition).